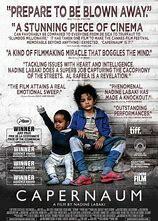 I defy you to walk out of "Capernaum" and name any 2 child actors that you have ever seen match the performances by Zain Al Rafeea and Boluwatife Treasure Bankole! It is almost as if they aren't acting but living their lives. The movie open with Zain in jail for knifing a man and he is now suing his parents for having given birth to him and not having the money to get him or his siblings papers to show who they are which is a necessity for survival. If you are reading this then you have no idea what being poor is and what being a child in the slums of Lebanon means where children are used as means to acquire money to buy food, where 11 year old girls are sold into marriage. This story is about how Zain reached the point of suing his parents, how he came to take care of the baby Boluwatife and why he attacked that man with a knife. Director and writer Nadine Labaki seems to use magic making the baby cry, laugh and do many other baby things while she lets the very charismatic Zain take and own the movie. "Capernaum" is a 2 hour plus movie with subtitles with only one major mistake. Hollywood is the only place that can make a 'happy ever after' ending make sense even when it doesn't!